This fun Horse Club Horse Stall with Lusitano Mare Set features a detachable roof and a door that can be opened and closed. With writable stickers and removable rosettes for decoration, it's customizable, too. 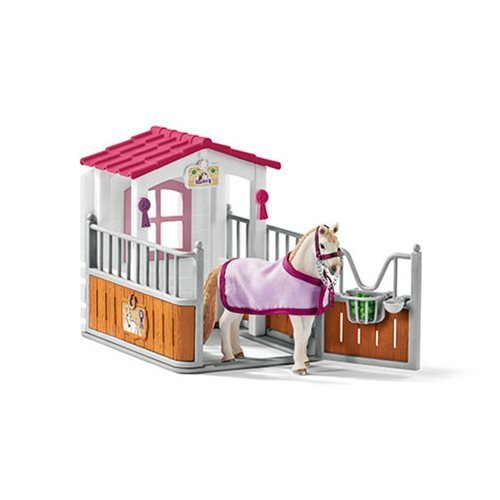 The set includes a Lusitano mare, a horse stall, a horse stall roof, a horse stall sign, a blanket, a halter, a rack, a water trough, a green apple, a purple rosette, a pink rosette, a sticker sheet, and assembly instructions. Expand your world of horses! This horse stall can be connected to the Horse Club stable and other stalls (all sold separately) with fences. The beautiful Lusitano mare feels right at home in the cozy horse stall. She drinks from the water trough to quench her thirst and plucks delicious hay from the rack. When it's time for training, her stall door is opened, and she's led out by the halter. Maybe she'll win another rosette soon!